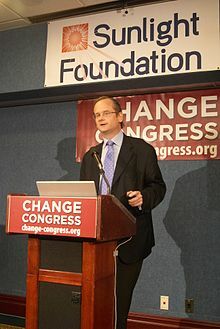 Lester Lawrence Lessig III (born June 3, 1961) is an American academic, attorney, and political activist. He is the Roy L. Furman Professor of Law at Harvard Law School and the former director of the Edmond J. Safra Center for Ethics at Harvard University. Lessig was a candidate for the Democratic Party's nomination for President of the United States in the 2016 U.S. presidential election, but withdrew before the primaries. In August 2015, Lessig announced that he was exploring a possible candidacy for President of the United States, promising to run if his exploratory committee raised $1 million by Labor Day. After accomplishing this, on September 6, 2015, Lessig announced that he was entering the race to become a candidate for the 2016 Democratic Party's presidential nomination. Lessig has described his candidacy as a referendum on campaign finance reform and electoral reform legislation. He stated that, if elected, he would serve a full term as president with his proposed reforms as his legislative priorities. He ended his campaign in November 2015, citing rule changes from the Democratic Party that precluded him from appearing in the televised debates. Lessig started his academic career at the University of Chicago Law School, where he was professor from 1991 to 1997. As co-director of the Center for the Study of Constitutionalism in Eastern Europe there, he helped the newly-independent Republic of Georgia draft a constitution. From 1997 to 2000, he was at Harvard Law School, holding for a year the chair of Berkman Professor of Law, affiliated with the Berkman Klein Center for Internet & Society. He subsequently joined Stanford Law School, where he established the school's Center for Internet and Society. Lessig has been politically liberal since studying philosophy at Cambridge in the mid-1980s. By the late 1980s, two influential conservative judges, Judge Richard Posner and Justice Antonin Scalia, selected him to serve as a law clerk, choosing him for his supposed "brilliance" rather than for his ideology and effectively making him the "token liberal" on their staffs. Posner would later call him "the most distinguished law professor of his generation." Lessig has been a proponent of the remix culture since the early 2000s. In his 2008 book Remix he presents this as a desirable cultural practice distinct from piracy. Lessig further articulates remix Culture as intrinsic to technology and the Internet. Remix culture is therefore an amalgam of practice, creativity, "read/write" culture and the hybrid economy. According to Lessig, the problem with the remix comes when it is at odds with stringent US copyright law. He has compared this to the failure of Prohibition, both in its ineffectiveness and in its tendency to normalize criminal behavior. Instead he proposes more lenient licensing, namely Creative Commons licenses, as a remedy to maintain "rule of law" while combating plagiarism. On March 28, 2004 he was elected to the FSF's board of directors. He proposed the concept of "free culture". He also supports free and open-source software and open spectrum. At his free culture keynote at the O'Reilly Open Source Convention 2002, a few minutes of his speech was about software patents, which he views as a rising threat to free software, open source software and innovation. From 1999 to 2002, Lessig represented a high-profile challenge the Sonny Bono Copyright Term Extension Act. Working with the Berkman Center for Internet and Society, Lessig led the team representing the plaintiff in Eldred v. Ashcroft. The plaintiff in the case was joined by a group of publishers who frequently published work in the public domain and a large number of amici including the Free Software Foundation, the American Association of Law Libraries, the Bureau of National Affairs, and the College Art Association. In March 2003, Lessig acknowledged severe disappointment with his Supreme Court defeat in the Eldred copyright-extension case, where he unsuccessfully tried to convince Chief Justice William Rehnquist, who had sympathies for de-regulation, to back his "market-based" approach to intellectual property regulation. Lessig announced the launch of his presidential campaign on September 6, 2015. On August 11, 2015, Lessig announced that he had launched an exploratory campaign for the purpose of exploring his prospects of winning the Democratic Party's nomination for President of the United States in the 2016 election. Lessig pledged to seek the nomination if he raised $1 million by Labor Day 2015. The announcement was widely reported in national media outlets, and was timed to coincide with a media blitz by the Lessig 2016 Campaign. Lessig was interviewed in The New York Times and Bloomberg. Campaign messages and Lessig's electoral finance reform positions were circulated widely on social media. His campaign was focused on a single issue: The Citizen Equality Act, a proposal that couples campaign finance reform with other laws aimed at curbing gerrymandering and ensuring voting access. As an expression of his commitment to the proposal, Lessig initially promised to resign once the Citizen Equality Act became law and turn the presidency over to his vice president, who would then serve out the remainder of the term as a typical American president and act on a variety of issues. In October 2015, Lessig abandoned his automatic resignation plan and adopted a full policy platform for the presidency, though he did retain the passage of the Citizen Equality Act as his primary legislative objective. In 2017, Lessig announced a movement to challenge the winner-take-all Electoral College vote allocation in the various states, called Equal Votes. Lessig is counsel for plaintiffs in Nemanich v. Williams, an electoral law case in Colorado. Lessig is married to Bettina Neuefeind, a German-born Harvard University colleague. The two married in 1999. He and Neuefeind have three children: Willem, Teo, and Tess. ^ "Harvard Law School Faculty Lawrence Lessig". ^ Lessig, Lawrence. "In Defense of Piracy". The Wall Street Journal. October 11, 2008. ^ Naureen Khan, May 2, 2014, Al Jazeera, May Day PAC wants to end all Super PACs, Accessed May 7, 2014, "kick-start May Day PAC, which, if successful, will help elect enough like-minded lawmakers to Congress in 2014 and 2016 to pass campaign finance reform ... 'Yes, we want to spend big money to end the influence of big money,' Lessig said"
^ "Harvard professor hits $1M benchmark for White House bid". msn.com. ^ a b Foran, Clare (August 11, 2015). "Why Exactly Is Lawrence Lessig Considering Running for President?". National Journal. Retrieved August 11, 2015. ^ Marans, Daniel (October 17, 2015). "Lawrence Lessig Withdraws 'Totally Stupid' Plan To Resign Presidency". Huffington Post. Retrieved 31 October 2015. ^ a b Graham, David (2 November 2015). "The 2016 U.S. Presidential Race: A Cheat Sheet". The Atlantic. Retrieved 2 November 2015. ^ Lessig2016.us (2015-11-02). The Democrats have changed the rules. ^ a b Lawrence, Lessig. "Curriculum Vitae". Archived from the original on July 7, 2010. Retrieved July 25, 2010. ^ "Center helps Eastern European countries shape constitutions". Retrieved January 13, 2016. ^ Lawrence, Lessig. "Short Biography". Archived from the original on July 22, 2010. Retrieved July 25, 2010. ^ "Lawrence Lessig named professor of law at HLS, director of Harvard's Edmond J. Safra Center for Ethics". Harvard Law School. December 12, 2008. Archived from the original on October 10, 2009. Retrieved July 25, 2010. ^ Lessig on "Aaron's Laws – Law and Justice in a Digital Age". YouTube (2013-02-20). Retrieved on 2013-09-19. ^ "Lessig portrayed on tonight's West Wing". Boing Boing. ^ "Supreme Court Clerk Hiring: Is It Becoming More Political?". Above the Law. Retrieved January 13, 2016. ^ Steven Levy (October 1, 2002). "Lawrence Lessig's Supreme Showdown". WIRED. Retrieved January 13, 2016. ^ "YMCA Youth and Government Pennsylvania (PA State YMCA)". Ymcapa.org. Retrieved 2011-01-23. ^ Lessig, Lawrence (2008-10-13). "McCain/Palin to YouTube: Get real (Lessig Blog)". Lessig.org. Archived from the original on May 21, 2011. Retrieved 2011-01-23. ^ "Remix Is a Cultural Right, Lessig Says". law.virginia.edu. 2004-11-18. Retrieved 2016-02-27. ^ Lessig, Lawrence (2012). "REMIX: How Creativity is Being Strangled by the Law". The social media reader. Mandiberg, Michael,. New York: New York University Press. pp. 155–169. ISBN 9780814764077. OCLC 778455386. ^ a b "Leadership – Free Software Foundation". Fsf.org. Retrieved 2011-01-23. ^ "free_culture". Randomfoo.net. Retrieved 2011-01-23. ^ "Spectrum Policy: Property or Commons?". Cyberlaw.stanford.edu. 2003-03-02. Retrieved 2011-01-23. ^ "Digital Universe Adds Leading Internet Expert Lawrence Lessig to Board of Advisors". California: Prnewswire.com. 2006-03-13. Retrieved 2011-01-23. ^ "commons". 2011. google video docid=7661663613180520595. Retrieved 2014-02-07. ^ Lawrence Lessig (January 8, 2009). Colbert Nation. Comedy Central. Event occurs at 2:16. Retrieved 2009-05-19. ^ "Freesouls - Foreword by Lawrence Lessig". freesouls.cc. ^ CBC NEWS. Google accused of turning its back on net neutrality. December 15, 2008. ^ Drew Clark. Software Freedom Fighters. The National Journal 33(30), July 28, 2001. ^ Elinor Mills. Domain games: Internet leaves the U.S. nest. InfoWorld Daily News. October 13, 1998. ^ "Q&A: Lawrence Lessig". C-SPAN. November 21, 2011. Retrieved March 26, 2013. ^ "Larry Lessig: Laws that choke creativity". TED talks. November 15, 2007. Retrieved March 26, 2013. ^ "TEDxNYED – Lawrence Lessig". TEDx talks. March 6, 2010. Retrieved March 26, 2013. ^ "Lawrence Lessig's Supreme Showdown". WIRED. Retrieved 2018-10-11. ^ Lessig Backs Away From Copy Fights In Courts, Congress. Washington Internet Daily 4 (42). March 4, 2003. ^ "Lessig v. Liberatino Music – Complaint". Electronic Frontier Foundation website. United States District Court. August 22, 2013. Retrieved February 28, 2014. ^ Laura Sydell (September 27, 2013). "Record Label Picks Copyright Fight—With The Wrong Guy". npr.org. Retrieved September 28, 2013. ^ "17 U.S. Code § 512 – Limitations on liability relating to material online". Legal Information Institute. Cornell University Law School. Retrieved February 28, 2014. ^ Brandle, Lars (February 28, 2014). "Liberation Resolves Copyright Issue with Lawrence Lessig, Admit 'Mistakes' Were Made". Billboardbiz. Billboard.com. Retrieved February 28, 2014. ^ "Twórca Creative Commons wygrał sprawę o bezprawne skasowanie filmu z YouTube'a". Techlaw.pl. Retrieved February 28, 2014. ^ Sydell, Laura (February 27, 2014). "A Win For Fair use After Record Label, Copyright Lawyer Settle". All Tech Considered. NPR. Retrieved February 28, 2014. ^ a b von Busack, Richard (February 25, 2014). "Breaking the Internet: Killswitch Screens at Cinequest". Metro Silicon Valley. Retrieved February 25, 2015. ^ a b Swegles, Fred (April 14, 2015). "Battle for Internet Control Fuels O.C. -produced Movie". Orange County Register. Retrieved April 16, 2015. ^ "The Price That You Pay for Rocking The Boat". Huffington Post. Retrieved March 27, 2015. ^ a b Gill, Kathy. "Lawrence Lessig at 'Killswitch' Seattle Premiere: Money, Politics, and the Battle for the Internet". GeekWire. Retrieved June 5, 2015. ^ Cheney, Kyle (December 5, 2016). "Lessig, lawyers to offer support to anti-Trump electors". Politico. Retrieved January 25, 2017. ^ Lessig, Lawrence (2007-06-19). "Required Reading: the next 10 years (Lessig Blog)". Lessig.org. Archived from the original on January 16, 2011. Retrieved 2011-01-23. ^ "Lessig's blog July 29, 2007 11:55pm". Archived from the original on October 15, 2012. ^ Lawrence Lessig (February 8, 2010). "How to Get Our Democracy Back". CBS News, The Nation. Retrieved 2011-12-14. ^ "Draft Lessig – Change Congress". 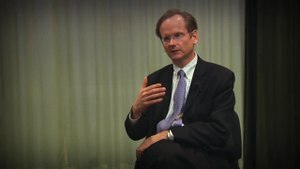 Draftlessig.org. Retrieved 2011-01-23. ^ a b Lessig, Lawrence (2008-02-25). "On why I am not running (Lessig Blog)". Lessig.org. Archived from the original on January 16, 2011. Retrieved 2011-01-23. ^ Previous post Next post (2008-03-20). "Stanford Law Professor Larry Lessig Bets 'Wikipedia' Approach Will Transform Congress | Threat Level from Wired.com". Blog.wired.com. Retrieved 2011-01-23. ^ "Sunlight Foundation Webcast". Visualwebcaster.com. Retrieved 2011-01-23. ^ "Call a Convention". Call a Convention. Archived from the original on February 6, 2010. Retrieved 2011-01-23. ^ About, Fix Congress First! ^ "Democracy in small states". LESSIG Blog, v2. Retrieved January 13, 2016. ^ a b Lawrence Lessig, "Why We're Marching Across New Hampshire to Honor Aaron Swartz", The Atlantic, January 10, 2014. ^ Jennifer Harper, "Restless grassroots: New Hampshire 'Rebellion' declares their state is not for sale" (Inside the Beltway column), Washington Times, December 25, 2014. ^ John Koziol, "NH Rebellion Marching Its Way to Concord for Reform", New Hampshire Union Leader, January 17, 2015. ^ a b Flore Vasseur, "The New Hampshire Rebellion: Larry Lessig's Long Walk", The Medium, December 15, 2014. ^ a b c d e Merica, Dan (August 11, 2015). "Harvard professor Lawrence Lessig is exploring a long shot presidential bid". CNN.com. Retrieved August 11, 2015. ^ Perry, Douglas (October 3, 2017). "Electoral-college reform would have defeated Donald Trump; now some Republicans back effort, seek action before 2020". The Oregonian. Retrieved 5 October 2017. ^ "The Scientific American 50 Award". Scientific American. Retrieved January 13, 2016. ^ "Eight scholars elected to academy of arts and sciences". News-service.stanford.edu. 2006-04-24. Retrieved 2011-01-23. ^ "Fastcase 50". Retrieved January 13, 2016. ^ "Honorary Doctor at the Faculty of Social Sciences 2013". Archived from the original on December 19, 2013. Retrieved December 19, 2013. ^ "Fête de l'université 2014 - Doctorats honoris causa". Archived from the original on January 30, 2014. ^ "The Webby Awards Gallery". 2014. Retrieved 2014-04-30. ^ "Wired 10.10: Lawrence Lessig's Supreme Showdown". wired.com. ^ Heilemann, John (2005-05-21). "Lawrence Lessig and John Hardwicke Fight Sexual Abuse and the American Boychoir School". Newyorkmetro.com. Archived from the original on January 9, 2009. Retrieved 2011-01-23. 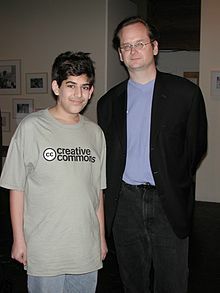 ^ Lessig, Lawrence (2005-05-25). "living with ghosts (Lessig Blog)". Lessig.org. Archived from the original on January 16, 2011. Retrieved 2011-01-23. ^ "Hardwicke v. American Boychoir". ^ Timothy J. Mullaney (March 6, 2000). "The Paul Revere Of The Web". Bloomberg. ^ "Personal Life - Lawrence Lessig: A Biography". Hyperink.com. Archived from the original on September 24, 2015. Retrieved August 12, 2015. ^ "USCA-DC Opinions – Released On 1/21/2011". Pacer.cadc.uscourts.gov. Retrieved 2011-01-23. ^ Grayson, Alan. "Grayson Screens Award-Winning "KILLSWITCH" Documentary". US House of Representatives. Archived from the original on February 27, 2015. Retrieved February 25, 2015. Lawrence Lessig. "The Electors Trust". This page was last edited on 25 January 2019, at 14:35 (UTC).